Every year Barron’s releases its Profiles of American Colleges directory that categorizes schools based on their selectivity. During the past decade, the number of schools that are considered the easiest to get into declined considerably while the number of schools that are characterized as the most elite rose. 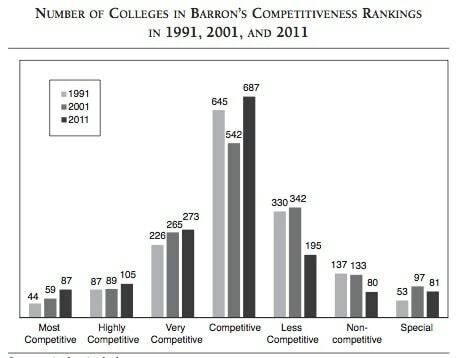 Are Colleges Really Getting More Competitive? At least on the surface, schools appear to be getting more competitive as they attract teenagers with more impressive academic profiles. But are these colleges and universities really attracting ever smarter students? Not really. The AEI notes, for instance, that ACT scores and SAT reading scores have remained virtually the same since the late 1980s and math SAT scores have risen only slightly (14 points). Another measure of teenage learning, which comes from the National Assessment of Educational Progress, shows no improvement in math and reading scores for 17-year-olds over the past 20 years. What has changed, however, is the high school grade point average, which has risen steadily. In 1990, the average GPA was 2.68, but today it’s 3.0 GPA. The National Center for Education Statistics reports that the number of students who report receiving “mostly A’s” in high school increased from 40% in 1996 to 47% in 2007. Another reason why schools are appearing more selective is because of the growing number of teenagers who are applying to more colleges. A survey from the National Association for College Admission Counseling suggests that 75% of colleges have seen an increase in applications every year for the past decade. 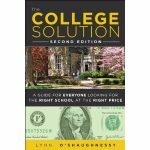 If you’d like to read the entire report, here it is: College Rankings Inflation: Are You Overpaying for Prestige? Lynn O’Shaughnessy is the author of the new second edition of The College Solution: A Guide for Everyone Looking for the Right School at the Right Price. Good Luck Graduating in Four Years!